Even if you live in a small space, you’re nomadic, or live in the city, you can compost your food waste. Depending on your type of space and your lifestyle, you might use a small worm bin, Bokashi composting, or a traditional compost bin. We'll review all the best strategies for fitting composting into a tiny home, and a few other cool composting technologies like composting toilets, making biogas, and a device that claims to turn your food into compost in a couple of hours. Using a worm bin is the best way to compost your food waste inside your home, and in the smallest space possible. You simply create a hospitable environment for worms (usually red wigglers), feed them your scraps, and harvest the compost. Unlike other styles of composting, a single worm bin can be used continuously, filling from one end and harvesting from the other. 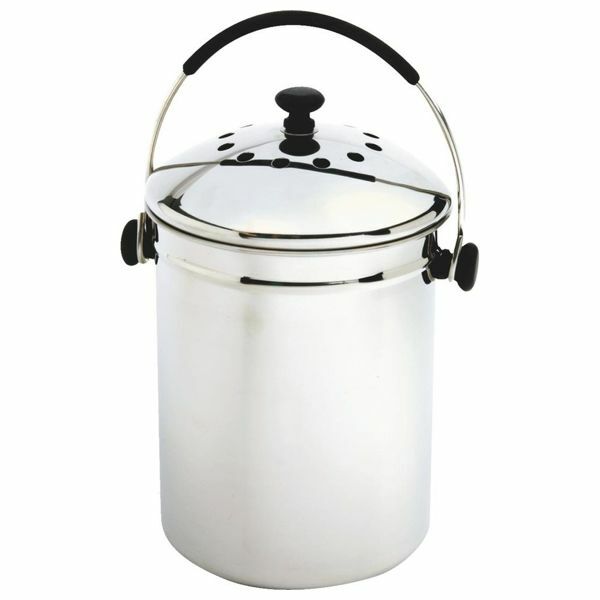 A worm bin sufficient to consume all the compostable food waste from a household can be built into a container the size of a small kitchen trash can. 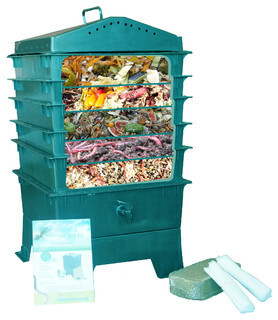 A well-designed and properly managed worm bin is odorless, lightweight, convenient, and will drastically decrease your volume of food waste. And the worm castings are great for your garden if you have one, or for making wildflower seed bombs if you don't. Typical DIY worm bin instructions use a stack of two Rubbermaid tubs, which is unnecessarily large, heavy, and difficult to maintain. This design follows from the idea that the worms will only occupy top 6" or so of the bin, so you need a wide, flat substrate for them to thrive. While it's true that worms need to live near the surface where they're close to the air, there is no need for that surface to be horizontal. A well ventilated vertical design will drain much better than a Rubbermaid tub bin, keeping your worms happy and active, and it will fit in a much smaller space. If you want to design the smallest possible worm bin for your own home, check out my personal tiny worm bin design, built into a pull-out kitchen trash can (9.3" x 9.5" x 18.1" tall). I've been using it for about a year, and it's been easy to maintain, has had no problem keeping up with our kitchen scraps, and our red wiggler worms are happy as ever. 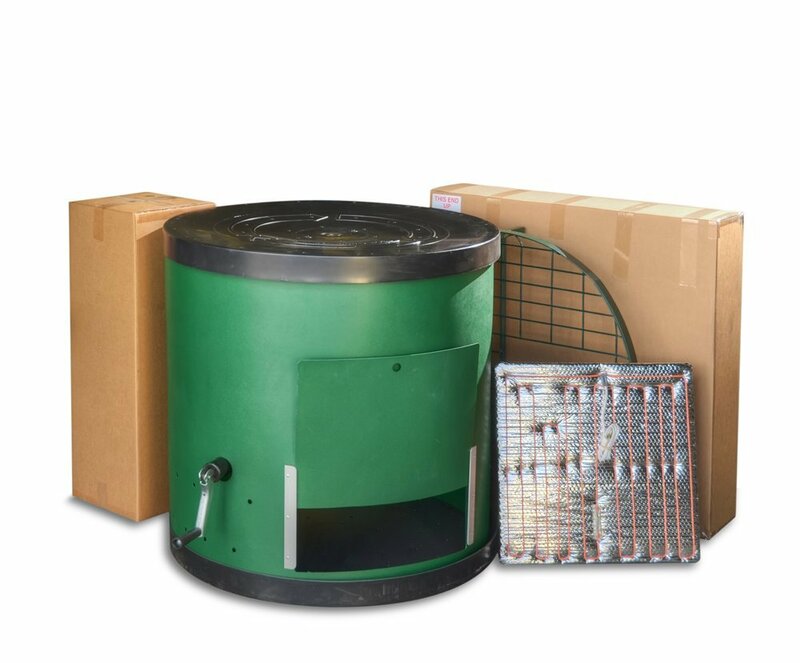 If you have the space for it and would rather buy a system than DIY, there are lots of commercial worm bin designs to choose from. 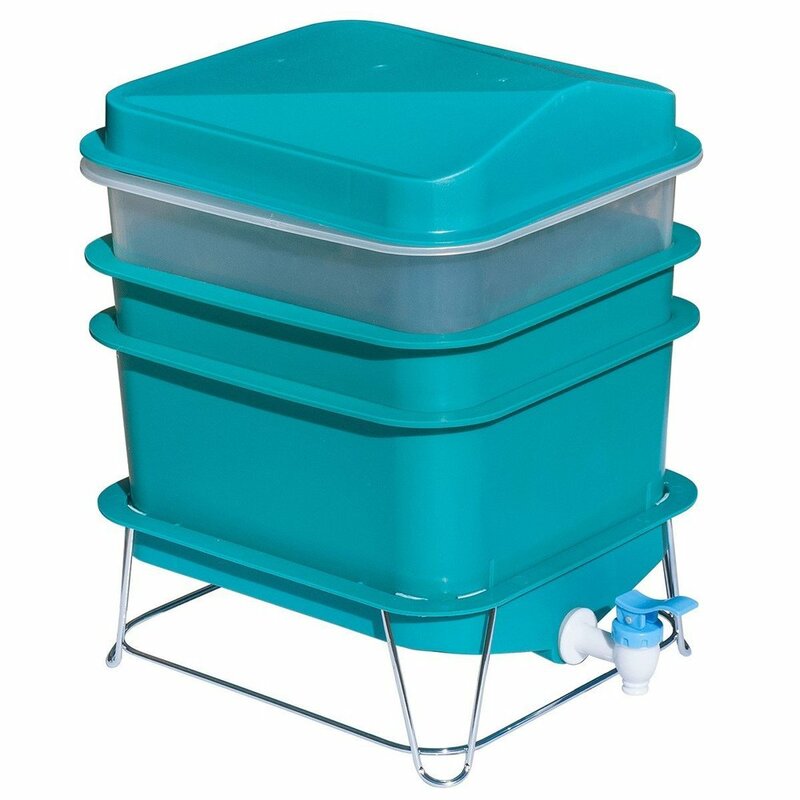 There doesn't appear to be a compact flow-through design like mine available commercially, so for use inside your home, a tray style worm bin is probably the best choice. 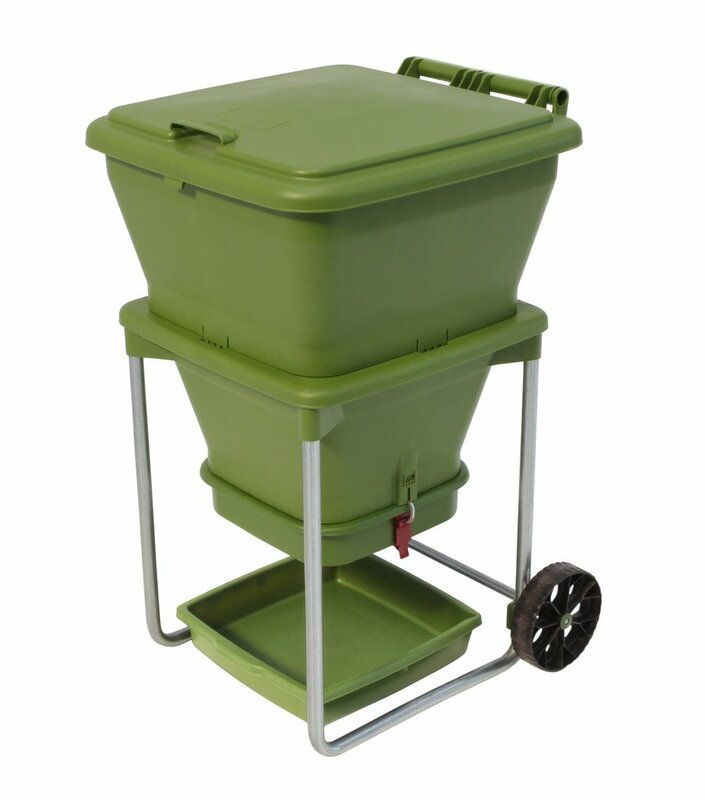 Some systems have expansion sets available which allow you to increase the size of your composter to accommodate larger quantities of food scraps. For larger scale outdoor vermicomposting, consider a flow-through composter like the Urban Worm Bag, the Hungry Bin, or enormous Worm Wigwam. Big systems like the Worm Wigwam are much larger than a single family would need, but are a good choice for a community garden or a restaurant that wants to recycle its food waste. For a single family wanting to feed their garden with vermicompost, consider the Worm Feast Compost Bin. Simply bury the bin in the middle of your garden, add your food scraps, and friendly local earthworms will do the rest. If you have access to a yard and a garden, traditional composting is simple, low-tech way to recycle your food waste. It's easy to get started, and while you can buy supplies to make your life easier, you can get started with nothing more than some scrap wood or cinder blocks to frame a bin, a bucket of food waste, and a pile of leaves or grass clippings. For a thorough primer on backyard composting, check out the composter's bible, Let it Rot. There are lots of DIY compost bin designs, but you can also purchase manufactured systems to make your job easier. 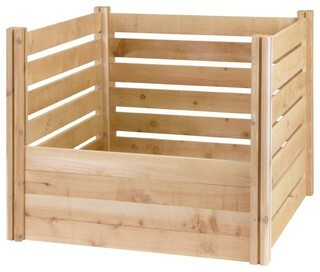 Single or double cedar bins are attractive and long-lasting designs for your garden. Vented black plastic designs like The Earth Machine or the Redmon Compost Bin provide a little better protection from animals, and can keep your compost hotter than open designs. 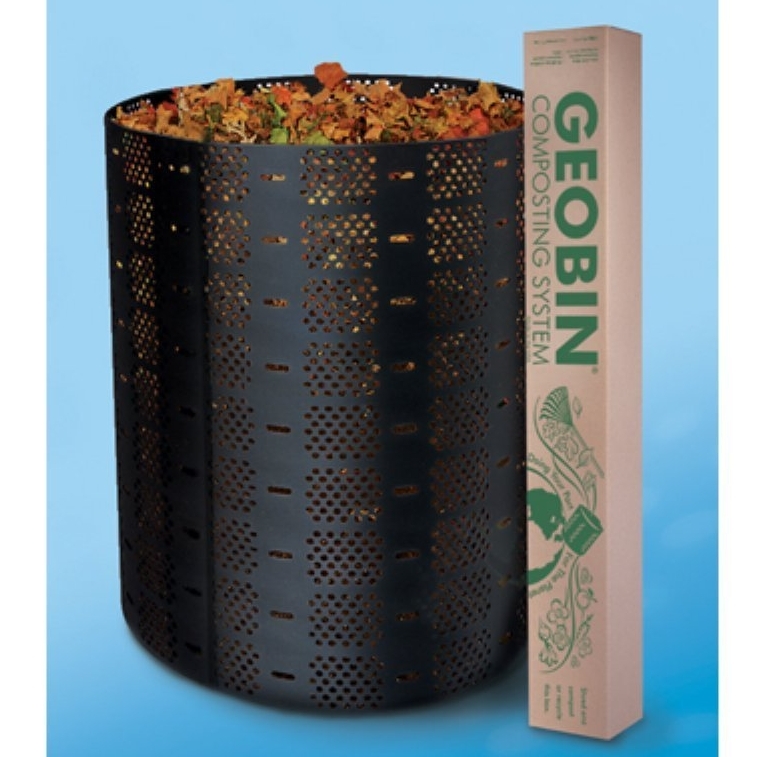 For the simplest setup, it's hard to beat a wire mesh bin or the very reasonably priced plastic Geobin. Since it can take a year for the composting cycle to complete, you'll need at least two bins to compost continuously. In order to monitor how well your compost is breaking down, you'll want a compost thermometer with a long probe. Your bin will occasionally need to be turned with a shovel or a pitchfork. Unless you want to run out to the bin every time you cook, you'll want to keep a closed container in your kitchen to collect food waste. Since it's going to be sitting on your counter, you'll want it to fit with your aesthetic. Check out a few options in white ceramic, stainless, matte graphite, and plastic. 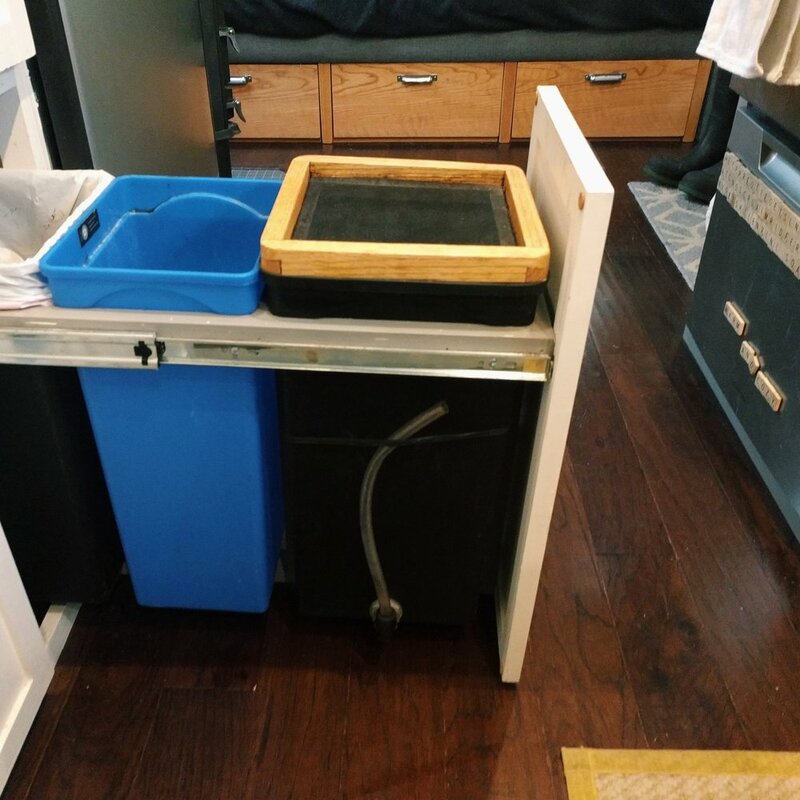 If you don't want the bin to sit on top of your counter, you can use a food waste bin mounted into your counter like the Compostizer, whose lid fits flush with your counter top. If you want to speed your composting, keep the local trash pandas out of your compost, and make it easier to turn your pile, consider using a compost tumbler. Models with legs tend to require less effort to tumble than models that sit on the ground. 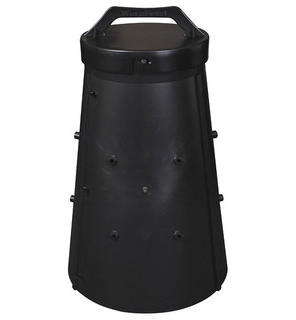 Black plastic might not be as visually appealing as lighter colors, but a black composter will get hotter in the sun, which will speed the composting process. For continuous composting, you'll either need two tumblers, or a tumbler with two chambers. Bokashi composting is a Japanese composting technique that can be used to break down food waste fairly quickly in small containers like 5-gallon buckets. The bucket is filled with food waste and inoculated with microbes that ferment the food waste anaerobically, essentially pickling it. Water is drained off the bottom and diluted for use as a fertilizer. After 2-4 weeks, once the food waste is thoroughly fermented, it can be dug into a garden where it will incorporate into the soil over a couple of months. Because the fermented waste is so acidic, it needs to finish breaking down and incorporating into the soil before it can be used by plants. Since Bokashi composting only requires a couple of buckets, it can be a great option for single-household food waste management in places where traditional composting bins aren't practical. But since the finished product from the Bokashi bucket needs to be buried to complete the composting cycle, this method would only work for someone who has access to a garden. Composting toilets are gaining popularity in the tiny living community because of their low impact, convenience, and ease of use. But the name "composting toilet" is sort of a misnomer. In almost all cases, very little composting actually occurs in a composting toilet. Composting toilets are simply dry, chemical-free toilets that collect waste, which can be composted later, or not. Composting human waste, or humanure, can be done safely in a traditional composting bin. It takes around a year to complete the composting cycle, and it's important that the compost achieves a high enough temperature to kill any pathogenic microbes. 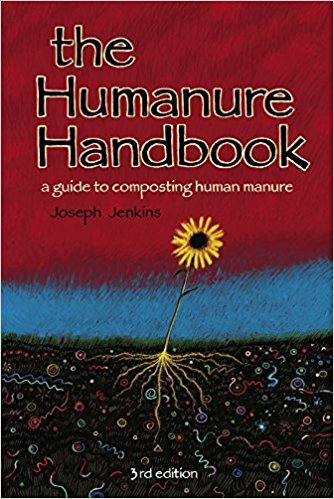 If you're interested in composting your humanure, the Humanure Handbook is the definitive guide. For those who are planning to complete the composting cycle, a simple single-container toilet is generally the best option. 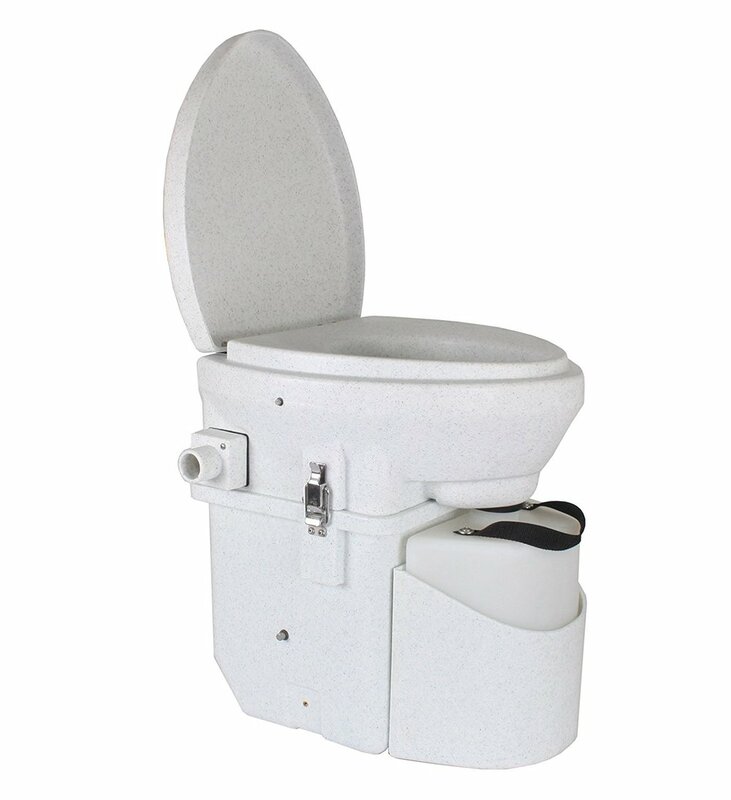 Most bucket toilets are custom-built into a space using standard 5-gallon buckets with Gamma Seal lids and a custom enclosure with a toilet seat mounted to the top. Solids and liquids go into the bucket together, and are buried in a cover material like sawdust or coco coir after each use. There's little benefit to separating the liquids from the solids if you intend to make compost, since the liquids are beneficial to the composting process. If enough cover material is used, there should be no smell, but a small exhaust fan is often added to the toilet to capture any odors that might be created. Once the bucket is full, its contents are added to a compost pile. 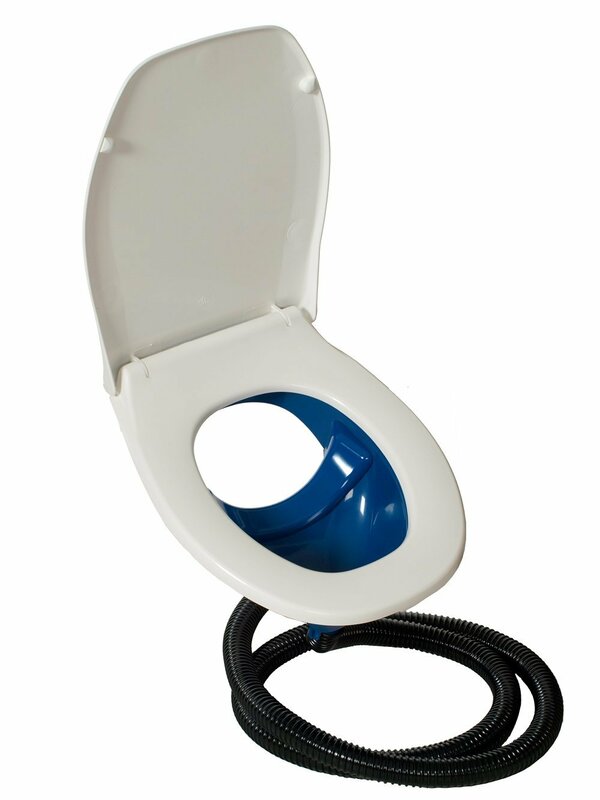 Urine diverting composting toilets are a good option for people who are looking for a dry (i.e. does not use water for flushing), relatively low-maintenance chemical-free toilet, but don't intend to make compost. Separating the solids from the liquids minimizes the odor of the system without requiring nearly as much cover material. Solids can be bagged and disposed of in the trash, or buried. Liquids can be flushed down a public toilet or percolated into the ground somewhere away from human activity. It's possible to use a urine diverting toilet for composting, but since solids and liquids should be mixed together in the composting bin, there's little benefit from the extra cost and complexity. The Nature's Head and the Air Head composting toilets are excellent self-contained solutions, with a urine diverting design, separate solids and liquids tanks, an auger to mix the solids tank, and an integrated exhaust fan. The Separett Weekend is a more modestly priced urine diverting design with an exhaust fan, but it doesn't include an auger for mixing the solids tank, and the liquids are diverted to a drain tube that needs to be hooked up to a tank or drainage system that's not included with the toilet. To make a DIY urine diverting bucket toilet, you can use a urine diverter kit like the Separett Privy Kit. One of the more interesting composting projects for off-grid use is to turn your food scraps into fuel. Biogas digesters are a simple, low tech way to manufacture usable natural gas off-grid and in remote areas. A biogas digester uses bacteria to break down organic material, and produce natural gas that you capture and use in your home. You can purchase a biogas digester commercially or build your own. In addition to natural gas, the biodigester produces a nutrient-rich liquid that can be used as fertilizer for a garden. It's worth nothing that since the biodigester doesn't get hot enough to kill pathogens, you probably don't want to empty your composting toilet into the digester and then water your food with the liquid that comes out. Is it practical? For most people, probably not. Creating a useful amount of gas requires a lot of ground food waste, around a 5-gallon bucket every day. If you live on a farm with access to a lot of manure, or you can convince your neighbors to save their food scraps for you, you might have enough to make your digester work for you. But for most people, the amount of food waste created by a single household isn't going to be enough to make a biogas digester worthwhile. For a fantastic primer on how a biogas digester works, and how to build one, check out Janice Kelsey and Jody Spangler's TEDx talk, Raising Baby Dragons to Save the World. While exploring composting options for our small space, I came across a device called the Food Cycler that claims to compost your food waste in a matter of hours. It turns out, it doesn't really compost anything. What it does is grind and dehydrate your food waste into a substance that resembles soil, but hasn't really broken down like compost has. The documentation calls this product "soil amendment," and you could certainly add it to soil, but it's not compost. It does accomplish our goal of decreasing the volume and odor of our waste. But since it requires a lot of electricity to run, it's not really suitable for off-grid use. There are better ways to do small-scale composting in your kitchen. Are you composting in your small space? What method are you using? Leave a comment below.